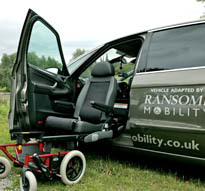 As a leading Motability accredited installer, Ransome Mobility Solutions provides high quality vehicle adaptations for drivers with disabilities. We can provide the complete service either at your home or workplace or with our free collection & delivery service. Every adaptation we make, from the fitting of a simple steering aid, to a complete bespoke vehicle adaptation, is fitted to the very highest of safety standards. We employ manufacturer trained engineers and every vehicle adaption is covered by our 12 month warranty. We also offer free annual follow-up checks to all customers. The ideal choice for lightweight scooters and wheelchairs weighing between 40kg and 80kg, our mini hoists are simple to use and make it easy to load and unload lightweight scooters and standard light weight wheelchairs in seconds. Our range of mini hoists will fit a wide variety of vehicles from hatchbacks or estates to MPV’s and 4x4s. If your scooter or wheelchair can fit into your vehicle’s luggage compartment, without being collapsed, we have a hoist option to suit. All our mini hoists are powered electronically by your vehicle’s battery and come with easy-to-use hand controls. All you have to do is press the relevant button for the movement required. The lift bracket is simple to attach and detach and when your scooter or wheelchair is loaded into the luggage compartment a retaining system will keep it secure. When not in use the hoist unit detaches from its mountings via two quick release pins – the frame only takes up a small amount of luggage space. The Mini hoist is available in both a 2 and 4 way powered option. The 2 way powered hoist raises and lowers the scooter or chair then requires the user to manually manoeuvre the equipment in and out of the luggage area. The 4 way option is fully automated. Our tailor-made fitting kits are neatly finished, and unobtrusive. The mini hoist can easily be transferred from one vehicle to another when required and has been designed to fold away neatly, preserving the condition of your vehicle. Our heavy duty range of hoists has been designed for scooters and powered chairs weighing between 100kg and 150kg. These hoists have all the functionality of our standard mini hoists but with added power. They will lift a variety of mobility aids although they are better suited to the larger scooter or more specialised, heavier, powered wheelchairs. These hoists make light work of lifting even the heaviest of scooters or powered wheelchairs. The lifting bracket is easy to attach even for those with limited dexterity or strength and the hand controls are very simple to use. Every hoist is powered directly from the vehicles own battery so it will always be ready for use. Our tailor-made fitting kits ensure a neat, professional finish that will not damage your car in any way and when the time comes to replace your vehicle, the hoist can be easily transferred to your new car or van. There are two models to choose from; a 4-way fully automated, electronic unit which manoeuvres your mobility aid directly into and out of your vehicle and a 2 way powered hoist, which does all the lifting and lowering for you but requires you to manually manoeuvre the equipment into and out of the luggage area. The left foot accelerator pedal is designed to be installed to the left of the brake pedal. This enables a driver to operate the accelerator with their left foot. There are different types of left foot accelerators, from flip-up models to those which attach to the floor beneath the pedals. We can recommend the option to suit you and your car and ensure that it is fitted safely. The twin-flip design allows the pedal to be switched between the left and right sides of the brake pedal. This allows the car to be driven by both disabled and able-bodied drivers. The twin flip accelerator matches the position of the original pedal, and has a dis-engagement mechanism which ensures it cannot be accidentally applied. Steering wheel balls are designed to help those who have difficulty holding or turning a steering wheel or have only the use of one hand. They simply clamp onto the steering wheel allowing the driver much greater control when steering the car. A very cost effective adaptation, they range from simple balls, to more complex 2 and 3 pin devices for those with impaired hand function. We have installed steering wheel balls in many different makes of car and can advise on the best option and positioning for you. A professionally installed steering ball will be positioned correctly to ensure safety and provide you with the best possible driving experience. 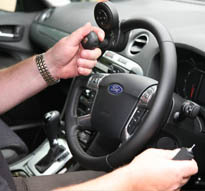 The popular quick release option allows the ball device to be quickly detached from the steering wheel when the car is being driven by an able bodied driver. This ingenious device allows the driver to change between the vehicle gears with ease. The device simply clamps to the existing gear selector handle and by lightly pushing the lever to one side, it engages the gear to be selected with the minimum of strength. With infra-red controls you can operate all of your vehicle’s secondary functions, at the touch of a button including the indicators, hazard lights, headlights, fog lights, horn, windscreen and rearscreen wipers and front and rear washers. We will install the infra-red control panel on your steering wheel, locating it in the best possible position for your comfort and control. All of the intra-red units we use have been carefully designed to make sure buttons are easily identifiable and easy to select. This is especially useful when cornering or negotiating traffic. The easy release hand-brake adaptation is fitted to a conventional parking brake, making it easier to operate for those with a lack of hand flexibility or a hand disability. The mechanism has the dual function of moving the operation of the hand brake closer to the driver, as well as making it easier to use. If a standard attachment is not suitable, either for your vehicle or your particular form of disability, we can recommend and install other adaptations which will better suit your specific circumstances. Push and pull hand controls are designed specifically for people who are not able to operate the foot pedals in automatic vehicles. The operation of these controls is very straightforward, simply pull the handle towards you to accelerate and release the handle to decelerate. To brake, simply push the handle away from you. These controls will suit most cars and we can tailor them to suit your driving position thus maximising your control and comfort. As we are Motability Accredited you can be confident that our installation will be carried out, to the very highest of standards. While many push and pull control systems are fitted to the outside of the steering column which infringes on manoeuvrability, we specialise in hand controls, installed inside the steering column. This adaptation provides additional space and makes it easier for other drivers to use the vehicle. These allow drivers to operate a range of secondary vehicle functions at the touch of a button. Secondary control systems can be specified with up to 18 functions but typically are used to control the indicators and hazard lights, headlights, horn, windscreen wipers and washers. The keypad has a built in illumination function for night time use and the robust steering ball or hand grip mounting provides assured and safe control and can be positioned almost anywhere on the steering wheel for maximum comfort and convenience. The control system can be quickly released from the steering wheel when not in use or when the vehicle is left unattended. Secondary control systems not only provide drivers with greater convenience but the confidence that they have complete control over their vehicle. Swivel seats are the ideal solution for those who have difficulty getting into and out of their vehicles. By simply rotating the seat towards the door, access is greatly improved. There are also options to extend accessibility further with devices which move the swivel seat out from the vehicle. For those with slightly impaired movement, a manually operated swivel seat system may be suitable. This adaptation sees a manually operated lever, placed at the side of the seat which can be released, allowing the chair to swivel outwards towards the open door. Automatic swivel seats are powered and operated by a simple hand control. This is the perfect solution for those with impaired manoeuvrability. At the touch of a button, the driver or passenger chair is automatically swivelled towards the open door. We can install a swivel seat arrangement to almost any vehicle and will help you choose the solution which is right for you. All installations are made by our trained engineers and are tested to make sure they provide a reliable solution to our customer’s needs. The Carony transfer system is a unique, easily operated and dockable wheelchair with variations for those who can, and cannot, wheel themselves. It consists of a wheel unit and a dockable chair which is used both inside and outside of the vehicle. This system eliminates the need to lift passengers into and out of vehicles. Simple manual operations manoeuvre the chair and the passenger from the wheel unit, into the vehicle and the wheel unit is stored in the boot of the vehicle when not in use. The Carony can also be used as a normal wheelchair, it is designed for comfort and has a large variety of accessories suited to various needs and functions. We can install this unit to almost any vehicle and combine it, if necessary, with a turnout swivel base in the case of high-silled vehicles such as minibuses and four wheel drive vehicles. All installations are carried out by our trained engineers and are tested to make sure that they provide a reliable solution to the customer’s needs. 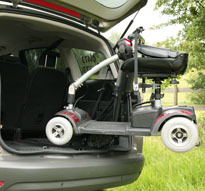 The Carony drive system allows you to drive your vehicle from your wheelchair. It is a powered wheelchair with a seat that can be adjusted to fit the optimum driving position within your vehicle. You enter your vehicle via a ramp or wheelchair lift and the wheelchair is then locked into position within the Drive LOC system to ensure that it is secure in line with ISO crash safety standards. The height of the chair is lowered into the optimum driving position and the footrests move forward carrying the knees down and away from the steering wheel. The Carony Drive System is designed to take up as little space inside a vehicle as possible and can be placed within a vehicle as small as a lowered floor Renault Kangoo. Outside the vehicle, when being used as a normal, powered wheelchair, it responds smoothly to joystick commands and is easy to manoeuvre in confined spaces with a width of just 64.5cm. We can provide detailed information on the types of vehicle which would suit this system as well as conduct the installation and testing required to ensure continued safety. Ransome Mobility Solutions are based in Suffolk and offer vehicle adaptions to customers in Suffolk, Norfolk, Essex, Hertfordshire, Northampton, Cambridge and Peterborough.